A railway platform is an area alongside a railway track providing convenient access to trains. Almost all stations have some form of platform, with larger stations having multiple platforms. The world's longest station platform is at Gorakhpur Junction in India at 1,355.40 metres. The Appalachian Trail station in the United States, at the other extreme, has a platform which is only long enough for a single bench. Among some United States train conductors the word "platform" has entered usage as a verb meaning "to berth at a station", as in the announcement: "The last two cars of this train will not platform at East Rockaway". The most basic form of platform consists of an area at the same level as the track, usually resulting in a fairly large height difference between the platform and the train floor. This would often not be considered a true platform. The more traditional platform is elevated relative to the track but often lower than the train floor, although ideally they should be at the same level. Occasionally the platform is higher than the train floor, where a train with a low floor serves a station built for trains with a high floor, for example at the Dutch stations of the DB Regionalbahn Westfalen (see Enschede). On the London Underground some stations are served by both District line and Piccadilly line trains, and the Piccadilly trains have lower floors. A tram stop is often in the middle of the street; usually it has as a platform a refuge area of a similar height to that of the sidewalk (e.g. 100 mm (3.9 in)), and sometimes has no platform. The latter requires extra care by passengers and other traffic to avoid accidents. Both types of tram stops can be seen in the tram networks of Melbourne and Toronto. Sometimes a tram stop is served by ordinary trams with rather low floors and metro-like light rail vehicles with higher floors, and the tram stop has a dual-height platform, as in Amstelveen, Netherlands. A train station may be served by heavy-rail and light-rail vehicles with lower floors and have a dual- height platform, as on the RijnGouweLijn in the Netherlands. Platform types include the bay platform, side platform (also called through platform), split platform and island platform. A bay platform is one at which the track terminates, i.e. a dead-end or siding. Trains serving a bay platform must reverse in or out. A side platform is the more usual type, alongside tracks where the train arrives from one end and leaves towards the other. An island platform has through platforms on both sides; it may be indented on one or both ends, with bay platforms. To reach an island platform there may be a bridge, a tunnel, or a level crossing. A variant on the side platform is the spanish solution which has platforms on both sides of a single through track. In US usage, this station would be described as having three platforms and four tracks (Tracks 1—4). In other English-speaking countries, it would be described as having four platforms (Platforms 1—4). Most stations have their platforms numbered consecutively from 1; a few stations, including Cardiff Central, Haymarket, King's Cross, Stockport, and Gravesend (in the UK); Uppsala, (Sweden); and Lidcombe, Sydney (Australia), start from 0. At Bristol Temple Meads platforms 3 through to 12 are split along their length with odd numbered platforms facing north and east and even facing south and west, with a small signal halfway along the platform. Some, such as London Waterloo East, use letters instead of numbers (this is to distinguish the platforms from numbered ones in the adjoining Waterloo main-line station for staff who work at both stations); some, such as Paris-Gare de Lyon, use letters for one group of platforms but numbers for the other. In the US, a designated place where a train can arrive is referred to as a "track" (e.g. "The train is arriving on Track 5"). The term "platform" is also used in the US but refers to the structure rather than a designated place for a train arriving. Therefore an island platform would be described as one platform with two tracks. In some cases, there are numbered tracks which are used only for through traffic and do not have platform access. In other English-speaking countries, "platform" can refer to both the structure or to a designated place for trains arriving (e.g. "The train is arriving on Platform 5"). Therefore an island platform might have two numbered platforms. Some of the station facilities are often located on the platforms. Where the platforms are not adjacent to a station building, often some form of shelter or waiting room is provided, and employee cabins may also be present. The weather protection offered varies greatly, from little more than a roof with open sides, to a closed room with heating or air-conditioning. There may be benches, lighting, ticket counters, drinking fountains, shops, trash boxes, and static timetables or dynamic displays with information about the next train. There are often loudspeakers as part of a public address (PA) system. The PA system is often used where dynamic timetables or electronic displays are not present. A variety of information is presented, including destinations and times (for all trains, or only the more important long-distance trains), delays, cancellations, platform changes, changes in routes and destinations, the number of carriages in the train and the location of first class or luggage compartments, and supplementary fee or reservation requirements. Some metro stations have platform screen doors between the platforms and the tracks. They provide more safety, and they allow the heating or air conditioning in the station to be separated from the ventilation in the tunnel, thus being more efficient and effective. They have been installed in most stations of the Singapore MRT and the Hong Kong MTR, and stations on the Jubilee Line Extension in London. Platforms should be sloped upwards slightly towards the platform edge to prevent wheeled objects such as trolleys, prams and wheelchairs from rolling away and into the path of the train. Many platforms have a cavity underneath an overhanging edge so that people who may fall off the platform can seek shelter from incoming trains. A dangerous practice is sitting on the edge of the platform, which requires withdrawing the legs fast enough when a train arrives. In high-speed rail, passing trains are a significant safety problem as the safe distance from the platform edge increases with the speed of the passing train. A study done by the United States Department of Transportation in 1999 found that trains passing station platforms at speeds of 240 kilometres per hour (150 mph) can pose safety concerns to passengers on the platforms who are 2 metres (6.6 ft) away from the edge due to the aerodynamic effects created by pressure and induced airflow with speeds of 64 kilometres per hour (40 mph) to 95 kilometres per hour (59 mph) depending on the train body aerodynamic designs. Additionally, the airflow can cause debris to be blown out to the waiting passengers. If the passengers stand closer at 1 metre (3.3 ft), the risk increases with airflow that can reach speeds of 79 kilometres per hour (49 mph) to 116 kilometres per hour (72 mph). In United Kingdom, a guideline for platform safety specifies that for the platforms with train passing speeds between 160 kilometres per hour (99 mph) and 200 kilometres per hour (120 mph), there should be a yellow-line buffer zone of 1.5 metres (4.9 ft) and other warning signs. If trains can pass at speeds higher than 200 kilometres per hour (120 mph), the platforms should be inaccessible to passengers unless there are waiting rooms or screened areas to provide protection. The European Union has a regulation for platforms that are close to tracks with train passing speeds of 250 kilometres per hour (160 mph) or more should not be accessible to passengers unless there is a lower speed limit for trains that intend to stop at the station or there are barriers to limit access. A common marking at curved platforms on the London Underground. Platforms usually have some form of warnings or measures to keep passengers away from the tracks. The simplest measure is markings near the edge of the platform to demarcate the distance back that passengers should remain. Often a special tiled surface is used as well as a painted line, to help blind people using a walking aid, and help in preventing wheelchairs from rolling too near the platform edge. In the US, Americans with Disabilities Act of 1990 regulations require a detectable warning strip 24 inches (61 cm) wide, consisting of truncated dome bumps in a visually-contrasting color, for the full length of the platform. Ideally platforms should be straight or slightly convex, so that the guard can see the whole train when preparing to close the doors. Platforms that have great curvature have blind spots that create a safety hazard. Mirrors or closed-circuit cameras may be used in these cases to view the whole platform. Also passenger carriages are straight, so doors will not always open directly onto a curved platform – often a platform gap is present. Usually such platforms will have warning signs, possibly auditory, such as London Underground's famous phrase "Mind the gap". There may be moveable gap filler sections within the platform, extending once the train has stopped and retracting after the doors have closed. The New York City Subway employs these at 14th Street–Union Square on the IRT Lexington Avenue Line and at Times Square on the 42nd Street Shuttle, and formerly at the South Ferry outer loop station on the IRT Broadway–Seventh Avenue Line. In the UK, recent rules require new platforms to be straight. Eastern end of longest platform in Kollam Junction railway station in India. It is now world's second longest railway platform. ^ "MNR Stations: APPALACHIAN TRAIL". as0.mta.info. Retrieved 2018-10-14. ^ Lee, Harvey Shui-Hong (December 1999). Assessment of Potential Aerodynamic Effects on Personnel and Equipment in Proximity to High-Speed Train Operations (PDF). United States Department of Transportation. Retrieved 25 April 2017. ^ Guidance on Interface between Station Platforms, Track and Trains (PDF) (2 ed.). Rail Safety and Standards Board Limited. March 2014. Retrieved 25 April 2017. ^ 2002/732/EC: Commission Decision of 30 May 2002 concerning the technical specification for interoperability relating to the infrastructure subsystem of the trans-European high-speed rail system referred to in Article 6(1) of Council Directive 96/48/EC (Official Journal L 245 ed.). The European Union. 9 December 2002. pp. 143–279. Retrieved 26 April 2017. ^ Dinda, Archisman (October 9, 2013). "Uttar Pradesh gets world's longest railway platform". GulfNews.com. Retrieved 9 October 2013. ^ "At a glance: Longest railway platforms in India". Railnewscenter. Archived from the original on 25 February 2015. Retrieved 25 February 2015. ^ "The Top 6 Longest Railway Platforms of India". Walk through India. Retrieved 25 February 2015. ^ "West Bengal: tea plantations and other Raj-era relics". 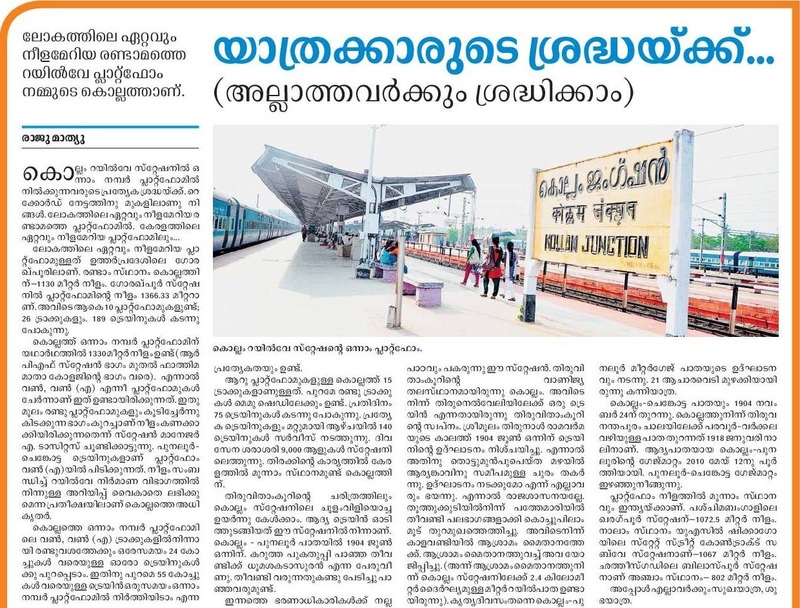 ^ "Malayala Manorama Daily(Kollam Edition 22/02/2015)". Retrieved 2015-02-22. ^ "Trivia". IRFCA. Retrieved 2012-01-21. ^ "Indian Railway Facts". iloveindia. Retrieved 2012-01-21. Abergynolwyn railway station is a station on the Talyllyn Railway at Abergynolwyn near Tywyn, Gwynedd in mid-Wales. It is 6 miles, 44 chains (10.54 km) from Tywyn Wharf. Originally this was the terminus for passenger trains, though the line continued onward to the incline up to the slate quarry at Bryn Eglwys, and another incline down into the village. In 1976 this former mineral line was opened to passengers, though Abergynolwyn remains the principal station at the eastern end of the line as there are no facilities at Nant Gwernol, the current terminus. As at Tywyn Wharf and all other stations, there is only one platform, on the north side of the line. When the line was extended it became necessary to accommodate two trains simultaneously, so the platform was extended in length, making it the longest narrow gauge railway platform in Britain at the time. Abergynolwyn is Welsh for Mouth of the River with a Whirlpool. In the United Kingdom and in Australia, a bay platform is a dead-end railway platform at a railway station that has through lines. It is normal for bay platforms to be shorter than their associated through platforms. In fluid dynamics, Bernoulli's principle states that an increase in the speed of a fluid occurs simultaneously with a decrease in pressure or a decrease in the fluid's potential energy. The principle is named after Daniel Bernoulli who published it in his book Hydrodynamica in 1738. Although Bernoulli deduced that pressure decreases when the flow speed increases, it was Leonhard Euler who derived Bernoulli's equation in its usual form in 1752. The principle is only applicable for isentropic flows: when the effects of irreversible processes (like turbulence) and non-adiabatic processes (e.g. heat radiation) are small and can be neglected. Bernoulli's principle can be derived from the principle of conservation of energy. This states that, in a steady flow, the sum of all forms of energy in a fluid along a streamline is the same at all points on that streamline. This requires that the sum of kinetic energy, potential energy and internal energy remains constant. Thus an increase in the speed of the fluid – implying an increase in its kinetic energy (dynamic pressure) – occurs with a simultaneous decrease in (the sum of) its potential energy (including the static pressure) and internal energy. If the fluid is flowing out of a reservoir, the sum of all forms of energy is the same on all streamlines because in a reservoir the energy per unit volume (the sum of pressure and gravitational potential ρ g h) is the same everywhere.Bernoulli's principle can also be derived directly from Isaac Newton's Second Law of Motion. If a small volume of fluid is flowing horizontally from a region of high pressure to a region of low pressure, then there is more pressure behind than in front. This gives a net force on the volume, accelerating it along the streamline.Fluid particles are subject only to pressure and their own weight. If a fluid is flowing horizontally and along a section of a streamline, where the speed increases it can only be because the fluid on that section has moved from a region of higher pressure to a region of lower pressure; and if its speed decreases, it can only be because it has moved from a region of lower pressure to a region of higher pressure. Consequently, within a fluid flowing horizontally, the highest speed occurs where the pressure is lowest, and the lowest speed occurs where the pressure is highest. The Gorakhpur Railway Station is located in the city of Gorakhpur in the Indian state of Uttar Pradesh. It has the world's longest railway platform. It serves as the headquarters of the North Eastern Railway. The station offers Class A-1 railway station facilities. On 6 October 2013, Gorakhpur became the world's longest railway platform, after inauguration of the remodelled Gorakhpur Yard, with a stretch of around 1.35 kilometres (0.84 mi). The city of Gorakhpur serves 10 local railway stations known as Gorakhpur Junction, Gorakhpur cantt, Domingarh, Sahjanwa, Sihapar, Maniram, Nakaha jungle, Kushmi, Jagatbela, and Unaula. Kurla (formerly Coorla, Station Code: C) is a railway station on the Central and Harbour lines of the Mumbai Suburban Railway network. It is among the oldest railway stations in India, it being part of the original 21 mile (33.8 km) Great Indian Peninsular Railway (GIPR) section between Bombay (Mumbai) and Tannah (Thane) that opened in 1853.Local trains terminating at Kurla began operating by 1879, a suburban terminus was built in 1913 and the line was quadrupled in 1915. A single line between Kurla and Chembur that had been laid for garbage clearance in 1906 was opened for suburban traffic in 1924. The service was operated by steam locomotives until the line was electrified in 1950.The Harbour line was officially opened on 12 December 1910, between Kurla and Reay Road. It was named so because it catered to the eastern neighbourhoods along the city's natural harbour. In 1925, the line was connected to the then Victoria Terminus via an elevated rail corridor between Dockyard Road and Sandhurst Road. The country's first EMU rakes, manufactured by English Electric Company, were introduced between Bombay VT & Kurla on the Harbour line in 1925. Kurla has eight operational platforms for the suburban local railway. Platform 1, 1A and 4 serve 'Slow' local trains. Platforms 2 and 3 are dedicated to trains originating and terminating at Kurla. Platforms 5 and 6 are used by 'Fast' local trains, while platforms 7 and 8 serve the Harbour line local trains. Platforms 9 and 10, which were originally used to terminate trains coming UP from Vashi were abandoned in the early 2000s. Lennonville is a derelict town in Western Australia near the town of Mount Magnet, established in 1898.Lennonville was gazetted in 1896, after gold having been found two years earlier at the location by prospectors Lennon and Palmer.At the peak of its existence, at the turn of the 20th century, the town had a population of 3,000 and five hotels, outperforming nearby Mount Magnet and Boogardie. By 1909, however, the town was already in decline and, after a huge fire swept through the main street of the town, a general exodus begun. Today, the most predominant reminder of the towns former glory is the railway platform. Luoyang railway station (simplified Chinese: 洛阳站; traditional Chinese: 洛陽站; pinyin: Luòyáng Zhàn) is a station on Longhai railway in Luoyang, Henan. Malenkovskaya is a train station on the Yaroslavsky suburban direction of Moscow Railway in Moscow, Russia. It is located on the border of Eastern and North-Eastern Administrative Okrugs, 4.5 kilometres (2.8 mi) from Yaroslavsky railway terminal. There are exits at the Rizhsky Proezd and 4 Luchevoy Prosek in the Sokolniki Park. Planernaya (Russian: Пла́нерная) is a Moscow Metro station. It opened on December 30, 1975 as the final section of the northern extension of the Krasnopresnensky radius. It is not to be confused with Planernaya Railway Platform on the Moscow-St Petersburg Railway seven kilometres to the North and on the other side of Khimki. Portsmouth Harbour railway station is a railway station in Portsmouth, England. It is situated beside Gunwharf Quays in the city's harbour, and is an important transport terminal, with a bus interchange and ferry services to Gosport and the Isle of Wight. The station currently has four platforms in use: numbered 1, 3, 4 and 5. It is managed by South Western Railway. Platform 2 is no longer in use.The station is built on a pier made of wood, between the Gunwharf Quays shopping centre and the Historic Dockyard. Railway platform height is the built height – above top of rail (ATR) – of passenger platforms at stations. A connected term is train floor height, which refers to the ATR height of the floor of rail vehicles. Worldwide, there are many, frequently incompatible, standards for platform heights and train floor heights. Where raised platforms are in use, train widths must also be compatible, in order to avoid both large gaps between platform and trains and mechanical interference liable to cause equipment damage. Differences in platform height (and platform gap) can pose a risk for passenger safety. Platform ramps, steps, and platform gap fillers together with hazard warnings such as "mind the gap" are used to reduce risk and facilitate access. Platform height affects the loading gauge (the maximum size of train cars), and must conform to the structure gauge physical clearance specifications for the system. Tracks which are shared between freight and passenger service must have platforms which do not obstruct either type of railroad car. To reduce construction costs, the platforms at stations on many railway systems are of low height, making it necessary for passenger cars to be equipped with external steps or internal stairs allowing passengers access to and from car floor levels. Sittard is a railway station located in Sittard, Netherlands. The station was opened in 1862 and is located on the Maastricht–Venlo railway and the Sittard–Herzogenrath railway. Train services are operated by Nederlandse Spoorwegen and Arriva. All services from South Limburg to the north pass through Sittard. Sittard has the longest railway platform in The Netherlands with a length of 700 metres. Summit Tank is a railway platform on the Unanderra-Moss Vale line in the Southern Highlands of New South Wales, Australia. The platform is located on the main line; there is an active passing loop and perway siding beside it. Ueda Station (上田駅, Ueda-eki) is a railway station in the city of Ueda, Nagano, Japan, jointly operated by the East Japan Railway Company (JR East), the third-sector operator Shinano Railway, and the private railway operator Ueda Electric Railway. Zhengzhou railway station (simplified Chinese: 郑州站; traditional Chinese: 鄭州站; pinyin: zhèngzhōuzhàn) is a passenger railway station in Erqi District, Zhengzhou, Henan. It is located in the city center, about 1 km southwest to the Erqi Memorial Tower. As the junction of the important Beijing-Guangzhou Railway and Longhai Railway, the station is one of the busiest in China, and is called as "the heart of Chinese railway network". Ōji Station (王寺駅, Ōji-eki) is a railway station in Ōji, Nara, Japan. Operated by West Japan Railway Company (JR-West) and Kintetsu Railway, it is one of the four oldest railway stations in Nara Prefecture, and forms a major junction in the region. The station serves the Yamatoji Line (Kansai Main Line), and is the terminus for the Wakayama Line and Kintetsu Ikoma Line. Kintetsu's station has a stationmaster who administrates between Motosanjoguchi Station and the station on the Ikoma Line and all stations on the Tawaramoto Line. The nearby Shin-Ōji Station (新王寺駅, Shin-Ōji-eki) is also the terminus for Kintetsu Tawaramoto Line.